D. A. Batrowny splits her time between New York State and The DC-Metro area. She has over 25 years of experience working with children and families in the field of nurse home visiting, growth and development, literacy, and early childhood education. She has worked as a home visitor, longitudinal study interviewer, children's non-profit program director and writer. She holds degrees in Nursing and Business Administration. She believes that all children should have the opportunity to reach their highest potential. Her goal is to share this information with the parents of every young child, starting at birth. This belief led to the idea for her first series, The "Artt" of Early Learning Series and The Early Ed Series. They were designed to promote growth and development, pre-literacy skills and fun! I Know Colors: The Early Ed Series Book 7 by D.A. Batrowny is a rhyming, educational picture book. The book teaches the main 12 colours in a fun way. It mentions things that are a particular colour, like bluebirds for blue and carrots for orange. But then there are also pictures of things that aren't listed. The book also describes the item that is listed, for example, that carrots grow in the ground. The book is also easy enough to read so that a young child who is just learning to read could cope with it. 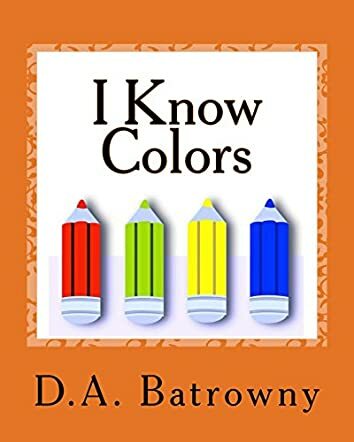 I Know Colors: The Early Ed Series Book 7 by D.A. Batrowny is perfect to help teach children the different colours. The book is fun and it rhymes, giving the book rhythm. The pictures are bold and show each colour very well, plus the pictures have lots of use of each colour. The pictures would also help children remember what they learned about that colour and what each colour looks like. The pictures show other things that are the colour and would be fun for a child to try to guess what it is. The rhyming in this book is very well done. The book, along with teaching colours, could also help first time readers, because the pictures clearly depict the words. I would recommend I Know Colors: The Early Ed Series Book 7 by D.A. Batrowny to all young children to help them learn colours.